Between 15 March and 23 April 2018, Ashfield Land and Gazeley will be carrying out a second stage of formal community consultation on its plans for Rail Central, the proposed new strategic rail freight interchange between Milton Malsor and Blisworth. The consultation will take place between 15 March and 23 April 2018 and include six public exhibitions at venues in Blisworth, Milton Malsor, Roade and Towcester. Alongside this, formal consultation will also take place with statutory consultees and other interested parties, under the processes known as Section 42 and Section 48. 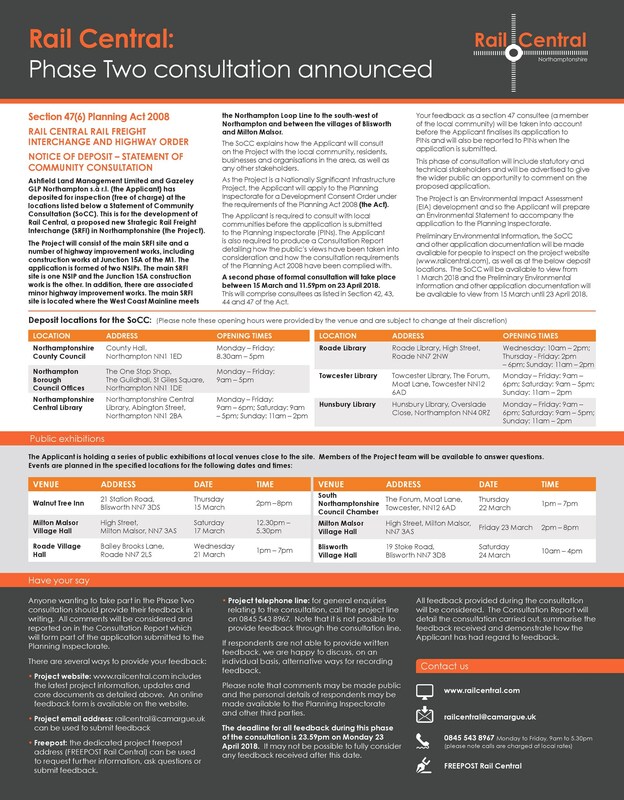 On 1 March 2018, the Statement of Community Consultation (SoCC) and the Report to Inform the SoCC, was published and are now available on the project website (www.railcentral.com) and in the deposit locations in the local area. This details how the developers will be consulting with the local community, and how the community can find out more and give their feedback. Click to download the Statement of Community Consultation (SoCC) and The report to inform the Statement of Community Consultation (SoCC). The Parish Council responded to the Roxhills Stage 2 Consultation. To view a copy of the Parish Councils response please click here to download a copy. Roxhills Consultations starting 9th October 2017. Public Exhibition being held Monday 9th October at the Hilton Hotel, Collingtree from 1.30pm to 7.30pm. Attached is a newsletter and summary document giving details of Roxhill’s proposed rail freight interchange at Junction 15 of the M1. The document also contains details of the consultation process which begins next week and lasts until 24th November 2017. This document is already being delivered in the vicinity of the proposed development, and many of you will already be aware of this process particularly those within our core consultation area. Details of a series of public exhibitions are contained in the attached, as are details of how to view details online and elsewhere and how to comment on the proposals. Milton Ham Appeal - Dismissed. The appeal for the Land at Milton Ham, Towcester Road, Northampton has been dismissed by the Planning Inspectorate. Click here to read the Appeal Decision. Martin Grant Homes and Harcourt Developments are together preparing a planning application to create a high quality residential development at Hampton Green near Wootton Fields, Northampton. As part of Martin Grant and Harcourt Developments pre-application consultation process for Hampton Green, Developers are holding two public exhibition events on Thursday 26 and Saturday 28 January. All the information being made available at events, including the exhibition display panels, project information leaflet and FAQ can be found on our consultation website at www.hampton-green.co.uk. If you have any questions or would like printed copies of the consultation materials we’ve produced please do contact the project team by email: info@hampton-green.co.uk, or on our Freephone enquiry line: 0800 9889 141. The initial consultation exhibitions are being held at the Hilton Hotel in Collingtree on 12th, 13th and 14th December from 1.30pm until 7.30pm and will present information about the emerging proposals, and also information about the ongoing technical and assessment work which will inform the preparation of the application over the coming 6 – 9 months. These exhibitions, and the ongoing dialogue we’ve been having already with some Parish Councils, are the start of an ongoing process of engagement and consultation. We expect to have further individual meetings with you and other consultees, and a further series of public consultation events is being planned for the late Spring or early Summer of 2017. The leaflet is also now available via the project website (www.northampton-gateway.co.uk), and the website will be updated on a regular basis when new information is available. For example, the exhibition display material will be available on the website in advance of the exhibitions. Comments are requested by 16th January to feed into our ongoing technical work. 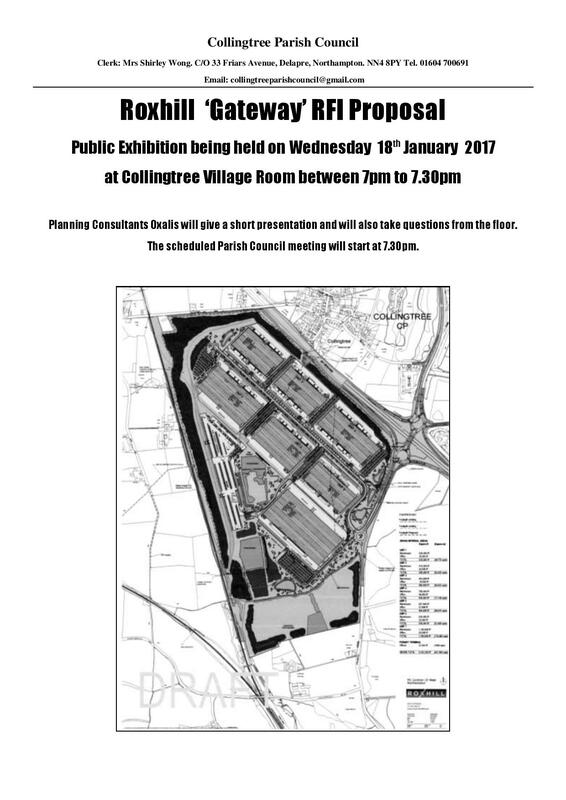 As you may already be aware, there has been a proposed development of a major industrial site on land adjoining Collingtree and Junction 15. The developers Roxhills have proposed a 5 million sq. ft. warehouse complex and rail link as an alternative to the ‘Rail Central’ scheme already proposed by Ashfield that has raised serious concerns for the likes of Blisworth and Milton Malsor. At the Collingtree Parish Council meeting on Wednesday 3rd August 2016 (a meeting that was well attended by residents) it was decided that one of the measures we could take as a community was to follow the example set by Milton/Blisworth by forming a Sub Committee to work alongside the Parish Council to ensure the best outcome for Collingtree Residents and Parishioners. The Parish Council will then arrange the formation of the Sub Committee as soon as possible. Please give as much support to this cause as possible as the impact on our village will be immense. Updates can be found on this website or click here to see updates on the Just Collingtree - Planning Watchdog page.